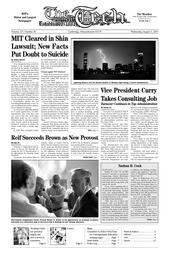 The discovery phase of the case has drawn out new evidence indicating that Shin’s death in 2000 was “much more likely a mistake” than a suicide, said Curtis R. Diedrich, a lawyer representing Dr. Linda Cunningham, who treated Shin at MIT Medical. The doctor who wrote the death certificate was “not necessarily in a position to make a determination whether this was something [Shin] intended or not,” he said, declining to give further explanation as litigation is ongoing. In a document requesting dismissal of counts against them, two MIT administrators also wrote that if the case went to trial, they would argue that Shin’s death was not a suicide. William Dailey Jr., who represents the other doctors named in the lawsuit, declined to comment on whether his clients would make a similar argument. In 2000, Shin committed suicide by self-inflicted burns, according to her death certificate, in her Random Hall room. Her death followed more than a year of mental health treatment at MIT Medical. Unlike in the previous two wrongful death lawsuits against the Institute, which MIT settled, MIT will pay no money to the Shins. All four counts against the Institute were dismissed by Justice Christine M. McEvoy of the Massachusetts Superior Court, who granted the motion of summary judgment in late June in favor of MIT. A summary judgment in favor of MIT means that no issues of fact exist that could implicate MIT, and that MIT cannot reasonably be viewed as liable on those counts. Three of the four counts deal with contractual obligations of the Institute to provide “necessary and reasonable” medical services to Shin. McEvoy’s decision said that there was no record of “specific promises” by MIT Medical staff to Shin; therefore, “there was no contract” between MIT and the Shins. David A. DeLuca, a lawyer representing the Shin family, said that the counts against MIT might have been limited by the “immunity that the institution enjoys” as an educational institution. Daryl Lapp, who represents MIT, did not return multiple requests for comment. McEvoy’s decision is available online at http://www-tech.mit.edu/V125/N30/shin-decision.pdf, and the original complaint filed by the Shins can be found at http://www-tech.mit.edu/V125/N30/shin-complaint.pdf. In 2000, MIT settled with the parents of Scott S. Krueger ’01, who died of alcohol poisoning, giving $1.25 million for a scholarship and $4.75 million in compensatory damages. More recently, MIT settled a wrongful death suit with the parents of Richard A. Guy Jr. ’99 earlier this summer, agreeing to fund a limited number of students in pre-orientation programs. Though charges against the Institute itself were dismissed, McEvoy ruled that individual MIT administrators and doctors could legally be held responsible for Shin’s death, and dismissed only a portion of the charges against them. In her decisions, McEvoy cited a “deans and psychs” meeting between administrators and doctors on the day of Shin’s death as providing sufficient evidence of relevant questions of fact for the counts to remain active. Despite information that Shin had said she would kill herself later that day, the participants at the meeting decided on no immediate treatment plan. According to a written statement, the Institute “will continue its defense of the members of its community who tried to help” Shin. MIT New Office Spokesperson Denise Brehm said that MIT typically does not comment about ongoing litigation. McEvoy granted summary judgment on only two of six counts against Random Hall Housemaster Nina Davis-Millis and Arnold R. Henderson, former dean of Counseling and Support Services (since renamed Student Support Services). The four counts that remain active are for negligence, wrongful death, and conscious pain and suffering; the two dismissed were for negligent misrepresentation and negligent infliction of emotional distress. Four doctors from MIT Medical who were involved in treating Shin for mental health issues, Cunningham, Kristine A. Girard, Anthony Van Niel, and Peter Reich, also filed a motion for partial summary judgment requesting that four of the six counts of medical malpractice against them be thrown out; two of the four were discarded. Girard also independently filed a motion requesting that all six counts against her be discarded; her motion was denied on the additional two counts. “We believe the quality of the care that was rendered was excellent, and that the attention that was given to the patient was entirely appropriate,” said Dailey, who is representing Girard, Reich, and Van Niel. Charges against a third administrator, Ayida S. Mthembu, associate dean of Student Support Services, and a fifth doctor, Lili A. Gottfried have been dismissed by agreement of both parties, according to DeLuca and Brehm. The remaining charges will continue to trial with a pre-trial conference set for Sept. 21. The judge’s rulings granting summary judgment in favor of the defendants can be appealed once decisions have been made on all counts filed by the Shins. Charges filed against MIT Police officers, who responded to a call by a Random Hall resident when the fire alarm went off and transported Shin to the hospital, were dismissed by agreement of all parties involved July 14, with no appeal possible. The counts filed against the MIT police officers, former Chief of MIT Police Anne P. Glavin, former Dispatcher Orlando Tirella, and former Officer Paul Valentino, were for negligence, wrongful death, conscious pain and suffering, and negligent infliction of emotional distress. The complaint filed by the Shins in 2002 had stated that the officers had “acted in a wilful, wanton, reckless, or grossly negligent manner,” causing Shin’s death, and had failed to provide reasonable security and emergency services to Shin. Beckett W. Sterner contributed to the reporting of this story.